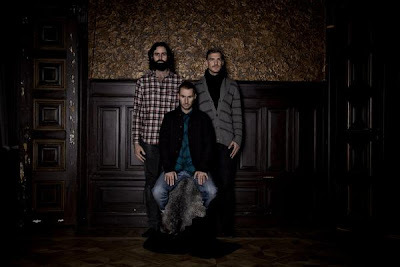 Miike Snow unlike what their name might imply are actually a three piece band from the amazing land of Sweden. Been hearing/reading alot about them in the blog world. First learned about them through their remix work, like the excellent one they did for Peter Bjorn & John's 'It Don't Move Me' that I posted awhile ago here. Seems they released their self titled debut album back in June. So far from the new album they've released two singles. First was 'Burial' a more downtempo atmospheric track and now 'Animal' which is a bit more indie rock and reminds me of bands like Passion Pit who funny enough they did a remix for. Variety is a good thing and after previewing the album it looks like that's what this album's all about. Variety! We like that. Recommended fare! Here's their first two videos. 'The Burial' video is so gorgeous and amazing! Seems like they shot on location on the streets of India or something. Matches the song perfectly. The 'Animal' video's not too shabby either, albeit more like a traditional band video. In addition here's a few tracks for you including a Crookers Remix of 'Animal'. You can download a bunch more remixes for free right off their myspace. Score! Noticed you mentioned their mix of Peter Bjorn & John's "It Don't Move Me", but PB&J also returned the favour and did an awesome remix of Miike Snow's "Animal"
hey is that link working? couldn't get to go through.